Kīholo Bay is a protected series of calm, turquoise tidepools inside a picturesque bay. It’s a great place to spend a beach day, especially if you want to be a little more off the beaten path. This bay used to be a bit “loved to death” by tourists and locals, but conservation efforts have really improved the location over the past few years. The biggest improvement has been prohibiting driving on the beach, which used to account for most of the ecosystem damage. If you want a look at Kīholo Bay before hiking down into it, stop by the marked “Scenic Area” adjacent to mile marker 82 along Hwy 19. The water in the bay often appears to be turquoise as a result of the mix of freshwater and seawater. This mix of salt and freshwater also creates murkier conditions than other locations on the Kohala Coast. Kīholo is one of the best places to view sea turtles. A unique feature here is Keanalele waterhole, a freshwater and saltwater mixed pool inside of a collapsed lava tube. The hike described on this page begins at Kīholo and travels north to lesser known Keawaiki Bay. There are lots of places to visit along the way and you could also do a big loop in the area. The hike described below covers everything, but you can easily customize your day to shorten or even lengthen your hike. This area is under park reserve status and still undergoing conceptual planning for future public use. Hours: Summer: April 1 to Labor Day: 7 am to 7 pm. Winter: After Labor Day to March 31: 7 am to 6 pm. Gates are locked nightly. Camping is allowed for a fee on weekends only (Friday through Sunday nights), and sites may be reserved up to 30 days in advance. Reserve Camping here. The trailhead has a portable toilet but no other facilities. No animals are allowed except properly registered service animals. No fires are allowed and no alcoholic beverages are allowed. This website has two other hikes that use this trailhead: one that simply visits Kīholo Bay, and another that travels far to the east past Kīholo to Mano Point. Trailhead: Just south of the scenic area adjacent to mile marker 82 on Hwy. 19 north of Kona, find an unmarked gravel road leading makai (toward the ocean). This dirt road is graded periodically, but it can be pretty rough in some spots. A carefully driven passenger car can certainly make it to the trailhead, but there are also a few pull-outs to bail and park along the access road if you think you might not make it. It can be tough to pass two cars in some areas, so drive slowly. Drive to the end of the road where there is a turnabout to help turn your car around. I don't recommend it for this hike, but you can also start at the Keawaiki Bay trailhead. To get there, on Hwy. 19, drive about ¾ of a mile between Mile Markers 78 and 79, closer to 79. It's just a pull-off near the highway. Do not attempt to drive the road or block the gate near the trailhead – this is private property. Be careful pulling back out into traffic. Gear: Standard hiking gear. Bring lots of water and sun protection. The trail is long and rough, so wear sturdy boots. Hike: Beginning at the roundabout parking area, walk a few yards out to Kīholo Bay and enjoy the view. Keep your eye on the murky water here because honu, green sea turtles, love to eat the seaweed in the bay. After you've checked out some interesting tidepools, hike northeast for less than a tenth of a mile and keep your eye on the woodline behind the beach for Keanalele, a collapsed lava tube with a freshwater spring. Continue north along Kīholo. You'll eventually pass a yellow mega-mansion, where you'll begin to pass by private properties. Hug the coastline and don't disturb any residents. One unique structure is called the "Bali House," and you surely won't miss it. You'll eventually round a nice bay with more private property and cross a small man-made stream on a little bridge. The little stream leads to Wainanali'i Pond, which is private property. After passing the stream, you'll be away from all the private property concerns. You're about a mile from the trailhead. Wainanali'i, the brackish turquoise lagoon in front of you was once a gigantic fishpond constructed by Kamehameha I in 1810 that had a two-mile seawall that was six feet tall and twenty feet wide. In 1859, a lava flow from Mauna Loa traveled 30 miles and destroyed this incredible engineering feat, leaving the lagoons you see today. These brackish lagoons provide an incredible spot for a swim. Honu, green sea turtles, love the lagoons as well and you should give them plenty of space. When you're ready, hike around the lagoon. You can hike out on the narrow strip of land that creates the final lagoon if you'd like. Once you round the corner after the lagoon, you enter a world of stark lava. 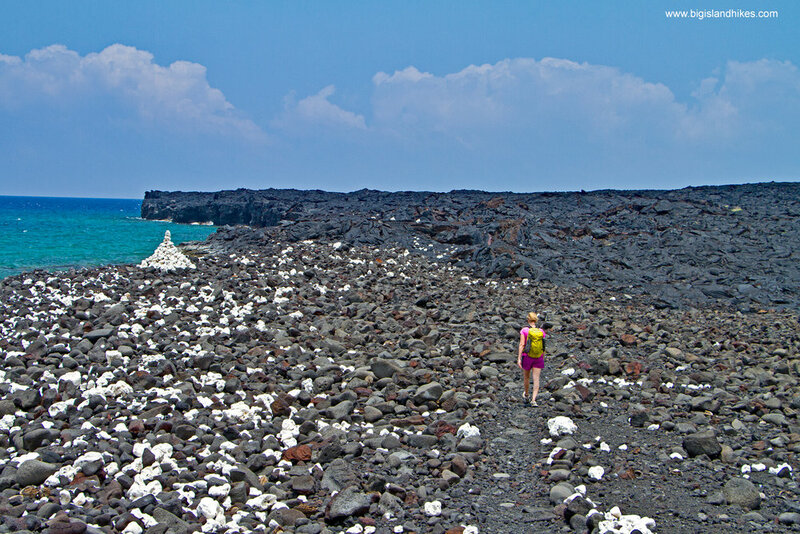 The trail can be difficult to follow at times, but there is often white coral marking the easiest route through the lava. In general, stay near the coast if you lose the trail and look out for coral markers and ahu (cairns). You're walking on the 1859 lava flows from Mauna Loa that destroyed Kamehameha's fishpond. Take your time and explore some of the fascinating lava features in Relaxing After a Hikethe area. You could hike a portion of this coastline and turn around at any time for a very nice day. Ohiki Bay is 1.25 miles from where you left the lagoon and started hiking on bare lava. It's then another 1.25 miles until you reach Keawaiki Bay. There is a large tract of private property on the southern end of Keawaiki, so you should obviously hug the shoreline near here and avoid trespassing. At Keawaiki, you can either retrace your steps for a 8.5 mile round trip or you can use the ancient Ala Loa trail to make a loop back to the lagoon. The Ala Loa, or King's Trail, was an ancient trail that spanned most of the island and many parts are still walkable today. A word of caution: this inland trail is extremely hot and stagnant out of the coastal breezes you enjoyed on the hike out. I only recommend hiking this trail early in the morning before the sun can cook the lava and raise the ambient temperature. I also think hiking along the coast is more scenic and interesting. So, either retrace your steps back to Kīholo or make the loop. If you choose to make the loop, the round trip mileage is 8.0. From Keawaiki, hike east along the access road easement until you reach the obvious intersection with the ramrod-straight Ala Loa. Hike south on the Ala Loa until you reach the lagoon and then rejoin the trail back to Kīholo.